Lp is a collection of programs used to provide an easy-to-use interface for printing a variety of document types on a variety of printers. Lp is the glue that connects various document language translators and printer communication programs together so that the users may have a consistent view of printers. Most of the glue is shell script, which can be easily modified. The user need not specify options to get sensible output in most cases. Lp is described here so that others may make additions and changes. Lp is used to format and print data on a variety of output devices. The need for lp was rooted in the inability of other printer spoolers to do simple tasks without a great deal of user specification of options. At the time lp was written, there were several printer languages, such as ImPress and PostScript, and an internally developed printer that would accept troff output. Now, all our printers take PostScript, but printers that use HPCL and HPGL abound and support for those printers may be added easily. A great deal of what underlies lp is taken from BSD’s lpr and System V’s lp. The important features of this system are that most of the programs are easily modified shell scripts and the user need not learn to use the large amount of underlying software developed by others. Lp runs under Plan 9 and several flavors of UNIX. This document deals with lp as it relates to Plan 9. Lp was developed using both Datakit and Ethernet to transport data between machines. Now only the Ethernet transport mechanism remains. Text, graphics, and formatted text files are appropriately processed and placed into a spool directory from which they are taken to be printed by a daemon process. Additional functions include checking the status of a printer queue and removing jobs from the printer queue. All the shell scripts (see rc(1)) associated with lp reside in the spool directory /sys/lib/lp except for the lp command itself, which resides in /rc/bin. Commands related to lp that are not shell scripts can most often be found in /$cputype/bin/aux. The directory where all the lp scripts reside is defined within lp by the shell variable LPLIB. In the remainder of this document, file names will be specified with this shell variable as their root. Lp requires an output device to be specified before it will process input. This can be done in any of three ways described here. 1) The file $LPLIB/defdevice may contain the name of a default output device. This may not be practical for environments where there are many printers. 2) The user’s environment variable LPDEST may be set to the name of the device to be used. This is often a more practical solution when there are several printers available. This overrides a defdevice specification. 3) The -d printer option to the lp command specifies printer as the device to which output should be directed, overriding the previous two specifications. 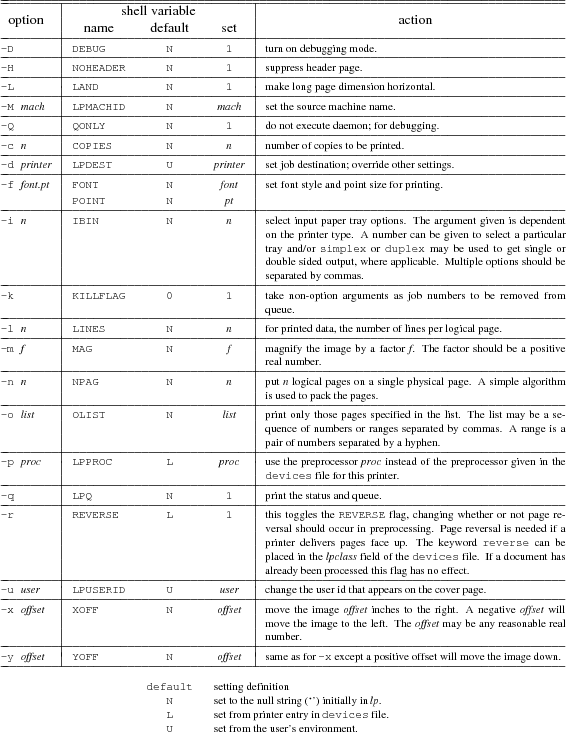 If printer is ?, a list of printers and other information in the devices file is printed, as shown in Figure 1. Quote the question mark to prevent it from being interpreted by the shell language as a metacharacter. Normally, lp uses the file command to figure out what type of input it is receiving. This is done within the generic process which is discussed later in this paper in the Process directory section. To select a specific input processor the -pprocess option is used where process is one of the shell scripts in the process directory. There are options available to modify the way in which a job is handled. It is the job of the lp programs to convert the option settings so they may be used by each of the different translation and interface programs. Not all options are applicable to all printer environments. Table 1 lists the standard lp options, the shell variable settings, and description of the options. LPDEST is the name of the device as given to lp with the -d option or as specified by the shell environment variable LPDEST or as specified by the file $LPLIB/defdevice. This name is used in creating directories and log files that are associated with the printers operation. LOC just describes where the printer is physically located. DEST_HOST is the host from which the files are printed. Files may be spooled on other machines before being transferred to the destination host. OUT_DEV is the physical device name or network address needed by the printer daemon to connect to the printer. This field depends on the requirements of the daemon and may contain a ‘–’ if not required. SPEED is the baud rate setting for the port. This field depends on the requirements of the daemon and may contain a ‘–’ if not required. LPCLASS is used to encode minor printer differences. The keyword reverse is used by some of the preprocessors to reverse the order the pages are printed to accommodate different output trays (either face up or face down). The keyword nohead is used to suppress the header page. This is used for special and color printers. The keyword duplex is used to coax double sided output from duplex printers. LPPROC is the command from the LPLIB/process directory to be used to convert input to a format that will be accepted by the device. The preprocessor is invoked by the spooler. SPOOLER is the command from the LPLIB/spooler directory which will select files using the SCHED command and invoke the LPPROC command, putting its output into the remote spool directory. The output is sent directly to the spool directory on the destination machine to avoid conflicts when client and server machines share spool directories. STAT is the command from the LPLIB/stat directory that prints the status of the device and the list of jobs waiting on the queue for the device. The status information depends on what is available from the printer and interface software. The queue information should be changed to show information useful in tracking down problems. The SCHED command is used to show the jobs in the order in which they will be printed. KILL is the command from the LPLIB/kill that removes jobs from the queue. The jobs to be removed are given as arguments to the lp command. When possible, it should also abort the currently running job if it has to be killed. DAEMON is the command from the LPLIB/daemon that is meant to run asynchronously to remove jobs from the queue. Jobs may either be passed on to another host or sent to the printing device. Lp always tries to start a daemon process when one is specified. SCHED is the command from the LPLIB/sched that is used to present the job names to the daemon and stat programs in some order, e.g., first-in-first-out, smallest first. The following sections describe the basic functions of the programs that are found in the subdirectories of $LPLIB. The programs in a specific directory vary with the type of output device or networks that have to be used. The generic preprocessor is the default preprocessor for most printers. It uses the file(1) command to determine the format of the input file. The appropriate preprocessor is then selected to transform the file to a format suitable for the printer. Here is a list of some of the preprocessors and a description of their function. A complete list of preprocessors and their descriptions can be found in the manual page lp(8). ppost Converts UTF text to PostScript. The default font is Courier with Lucida fonts filling in the remainder of the (available) Unicode character space. tr2post Converts (device independent) troff output for the device type utf. See /sys/lib/troff/font/devutf directory for troff font width table descriptions. See also the /sys/lib/postscript/troff directory for mappings of troff UTF character space to PostScript font space. p9bitpost Converts Plan 9 bitmaps (see bitfile(9.6)) to PostScript. g3post Converts fax (CCITT-G31 format) to PostScript. hpost Does header page processing and page reversal processing, if necessary. Page reversal is done here so the header page always comes out at the beginning of the job. Header page processing is very location-dependent. The generic spooler is responsible for executing the preprocessor and directing its output to a file in the printer’s queue. An additional file is created containing information such as the system name, user id, job number, and number of times this job was attempted. Certain printer handling programs do not require separate preprocessing and spooling. For such circumstances a nospool spooler is available that just executes the preprocessing program. The processing and spooling functions are assumed by this program and the output is sent to OUT_DEV or standard output if OUT_DEV is ’-’. The pcclone spooler is used to send print jobs directly to a printer connected to a 386 compatible printer port (See lpt(3)). The function of the shell scripts in the stat directory is to present status information about the printer and its queue. When necessary, the stat scripts may be designed to return information about the local queue as well as the remote queue. This is not done on Plan 9 because many systems share the same queue directory. The scheduler is used to print the queue in the order in which the jobs will be executed. 3) attempts to restart the daemon. The daemon shell scripts are the last to be invoked by lp if the -Q option has not been given. The daemon process is executed asynchronously with its standard output and standard error appended to the printer log file. The log file is described in a subsequent section. Because the daemon runs asynchronously, it must catch signals that could cause it to terminate abnormally. The daemon first checks to see that it is the only one running by using the LOCK program found in the /$cputype/bin/aux directory. The LOCK command creates a LOCK file in the printer’s queue directory. The daemon then executes the scheduler to obtain the name of the next job on the queue. The processing of jobs may entail transfer to another host or transmission to a printer. The details of this are specific to the individual daemons. If a job is processed without error, it is removed from the queue. If a job does not succeed, the associated files may be moved to a printer specific directory in $LPLIB/prob. In either case, the daemon can make an entry in the printer’s log file. Before exiting, the daemon should clean up lock files by calling UNLOCK. Several non-standard daemon programs have been designed to suit various requirements and whims. One such program announces job completion and empty paper trays by causing icons to appear in peoples’ seemail window. Another, using a voice synthesizer, makes verbal announcements. Other daemons may be designed to taste. This lists all the job files in this printer’s queue in modification time order. Jobs entering the queue have a dot (.) prefixed to their name to keep the scheduler from selecting them before they are complete. There are four directories where lp writes files. On the Plan 9 release these directories may be found in a directory on a scratch filesystem that is not backed-up. This directory is /n/emelieother/lp. It is built on top of a file system other that is mounted on the file server emelie. The four directories in this scratch directory are log, prob, queue, and tmp. Lp binds (see bind(1)) the first three into the directory /sys/lib/lp for its processes and their children. The tmp directory is bound to the /tmp directory so that the lp daemons, which run as user ‘none’, may write into this directory. On any new installation, it is important that these directories be set up and that the /rc/bin/lp command be editted to reflect the change. If you do not have a scratch filesystem for these directories, create the four directories log, prob, queue, and tmp in $LPLIB (/sys/lib/lp) so that they are writable by anyone. The log files for a particular printer appear in a subdirectory of the spool directory log/printer. There are currently two types of log files. One is for the daemon to log errors and successful completions of jobs. These are named printer.day where day is the three letter abbreviation for the day of the week. These are overwritten once a week to avoid the need for regular cleanup. The other type of log file contains the status of the printer and is written by the program that communicates with the printer itself. These are named printer.st. These are overwritten with each new job and are saved in the $LPLIB/prob directory along with the job under circumstances described below. When a printer does not appear to be functioning these files are the place to look first. There are conditions that occur which are not handled by the daemons. One such problem can only be described as the printer entering a comatose state. The printer does not respond to any messages sent to it. The daemon should recover from the reset and an error message will appear in the log files. If all else fails, one can kill the first job in the queue or remove the LOCK file from the queue directory. This will kill the daemon, which will have to be restarted. A Plan 9 CPU server can be set up as a printer’s spooling host. That is, the machine where jobs are spooled and from which those jobs are sent directly to the printer. To do this, the CPU must listen on TCP port 515 which is the well known port for the BSD line printer daemon. The file /rc/bin/service/tcp515 is executed when a call comes in on that port. The Plan 9 lpdaemon will accept jobs sent from BSD LPR/LPD systems. The /$cputype/bin/aux/lpdaemon command is executed from the service call and it accepts print jobs, requests for status, and requests to kill jobs. The command /$cputype/bin/aux/lpsend is used to send jobs to other Plan 9 machines and is usually called from within a spooler or daemon script. The command /$cputype/bin/aux/lpdsend is used to send jobs to machines and printers that use the BSD LPR/LPD protocol and is also usually called from within a spooler or daemon script. Special thanks to Rich Drechsler for supplying and maintaining most of the PostScript translation and interface programs, without which lp would be an empty shell. Tomas Rokicki provided the TeX to PostScript translation program.